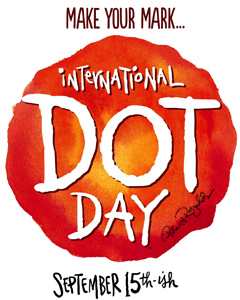 Celebrate International Dot Day! Make Your Mark! Nominate a person or group for this year's Make Your Mark Award here. Celibri-dots - See some amazing dots created by some amazing celebrities! If you are as obsessed with Celibri-dots as I am, try some fun Celibri-dot activities like this one - Puzzles! Getting Started: How are we celebrating International Dot Day? We'll read the book The Dot, by Peter H. Reynolds. We'll find a guest reader to help us kick-off this special day. That should be easy. Everyone loves to read, right? Decorations and Designs: We found some great dot wrapping paper for our classroom door. Each class member will get to have a dot photo taken in front of the dot paper. Before International Dot Day the children will design their own dot art, and we will have a great Dot Gallery opening on Dot Day. In past years, we've created giant stuffed dots as well as microdots. We'll also have a large piece of chart paper displayed. All who come to visit our classroom on Dot Day will be asked to create their own original DOT. They will, of course, have to sign their artwork. We will have dot chart paper from previous years displayed in our gallery. Activities: The possibilities are endless. Think of all the things that have dots or are like dots: there are lots of things to do with dominoes, button sorting, a dot hunt around school, "pass the dot" (we passed around a large, plastic ring as we said "good morning" for our Morning Meeting greeting-see video), some interesting geometry lessons, Twister. More Math: Search the awesome site http://www.mathwire.com for lots of great DICE games. Use the search box at the top, right of the screen. Type in "dice" to see many ideas. We especially like "The Game of Pig." 30 Circle Challenge: This is a quick creativity challenge. The web site includes a template, which is a paper with 30 small circles on it. The task is to draw something in each of the 30 circles in three minutes. There are ways to modify the activity to suit your group and interests. Click here for more information. Make Your Mark Award: Use this award (or edit if you want) to say "thank you" to those who are already making their mark. Print it on card stock. Keep it as an 8 1/2x 11 or cut out the circle to be a true DOT award. You can sign it or have an official Award Signer in your class. If your special dot award winner is not local, send this award electronically or through the mail. If possible, consider a Skype call to your special friend on Dot Day. Science Connection: Water Dots - Enlarge your mark! Teach your students about magnification with simple drops (dots) of water. Use drops of water on wax paper to magnify bits of newspaper, magazines, etc. A great introductory lesson for magnification. Dot Treats: What holiday doesn't have special food? There's candy buttons (dots on paper) and DOTS candy (bad for teeth, but so appropriate for the day) to start. Brainstorm with your class to plan your dot-based menu - what foods come in the shape of a circle or sphere (3D dots)? This is lots of fun and will get your kids thinking. You'll also get to know a bit about your students, their likes and dislikes. It's another great get-to-know-you activity for the beginning of the year. And choose your dot-plates wisely. Decorations are important!